Practice l ink.com F A ll 2018 37 "Everyone works together as a team and I have never worked at a place like this... The physicians are in control of the medical decisions at this hospital and administration is there to support that. That is something that you haven't seen in other facilities." John Gamble III, M.D., Interventional Radiology >> Watch Dr. Gamble's video at: bit.ly/2L3zCS4 CHECK OUT THE AMAZING OPPORTUNITIES AT CMH Recruiting for: Anesthesiology; Cardiology-General; Cardiology-Interventional; Dermatology; Endocrinology; Family Medicine; Family Medicine with OB; Geriatrics; Hematology/Oncology; Hospitalist; Internal Medicine; Med-Peds; Neurologist; Orthopedics: Foot & Ankle; Orthopedics: Hand & Upper Extremity; Pain Management; Psychiatry; Urgent Care; and Urology. Top 1% in the nation for the 2 nd year in a row! CMH PHYSICIAN SATISFACTION RATE Donna Shelby, Physician Recruiter donna.shelby@citizensmemorial.com 417-328-6273 • citizensmemorial.com John Gamble III, M.D. Citizens Memorial Hospital Bolivar, Missouri RIGHT HERE IN DELAWARE. At Bayhealth, our physicians have access to sandy beaches, boutique and outlet shopping, and countless water sports. With major cities like Philadelphia, Baltimore and New York within close driving distance — the possibilities are endless. Bayhealth is central and southern Delaware's largest health care system and is an affiliate of Penn Medicine in heart and vascular, cancer, and orthopaedics. To learn more about available medical staff positions, contact Physician Recruiter Mark Douyard at 302-744-6603 or email him at Mark_Douyard@bayhealth.org. 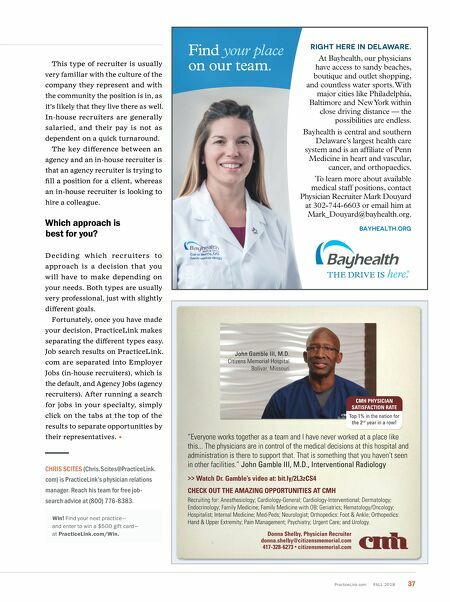 BAYHEALTH.ORG Find your place on our team. This type of recruiter is usually very familiar with the culture of the company they represent and with the community the position is in, as it's likely that they live there as well. In-house recruiters are generally salaried, and their pay is not as dependent on a quick turnaround. 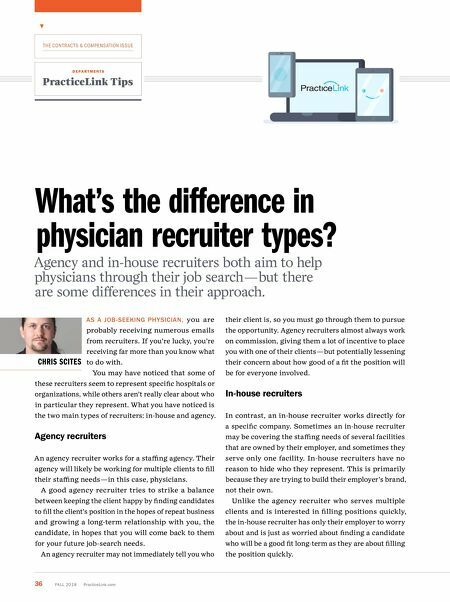 The key difference between an agency and an in-house recruiter is that an agency recruiter is trying to fill a position for a client, whereas an in-house recruiter is looking to hire a colleague. Which approach is best for you? Decid i ng wh ich recr u iters to approach is a decision that you will have to make depending on your needs. Both types are usually very professional, just with slightly different goals. Fortunately, once you have made your decision, PracticeLink makes separating the different types easy. Job search results on PracticeLink. com are separated into Employer Jobs (in-house recruiters), which is the default, and Agency Jobs (agency recruiters). After running a search for jobs in your specialty, simply click on the tabs at the top of the results to separate opportunities by their representatives. CHRIS SCITES (Chris.Scites@PracticeLink. com) is PracticeLink's physician relations manager. Reach his team for free job- search advice at (800) 776-8383. Win! Find your next practice— and enter to win a $500 gift card— at PracticeLink.com/Win.